Metro says they broke up a large gang party at The Rio over the weekend. Austin Carter reports. 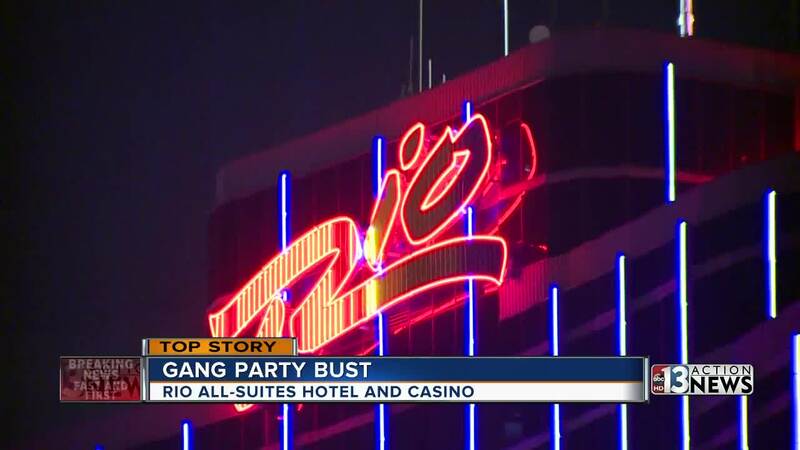 Police say officers broke up a large gang party at the Rio hotel-casino early Sunday morning. According to the Las Vegas Metropolitan Police Department, officers from the Convention Center Area Command broke up the large gang party around 2 a.m.
Over a dozen documented gang members were arrested, and five firearms were confiscated. The identities and mug shots of at least nine arrested were released Monday afternoon. They were identified as Antonio Williams, Antron Sims, Lexus Sherman, Phillip Semper, Steven Neal, Corey Johnson, Michael Green, Jerome Francis and Ashley Medlock. Johnson and Semper were both arrested for one felony count each of carrying a concealed weapon, and the remaining seven suspects had active warrants for their arrests for charges unrelated to this incident.